A comprehensive approach to cycling infrastructure in Rhode Island’s capital city through a focus on connectivity, community, and convenience. Protected bike lanes (green) running through Providence would have the potential to transform the city, connecting the East Bay Bike Path, the Woonasquatucket River Greenway, and the Blackstone River Bikeway across college hill. Lack of infrastructure presents an obstacle to current and potential bike commuters in Providence, especially in and around College Hill. How can we change our urban landscape to foster environmental sustainability and a culture of environmental stewardship? 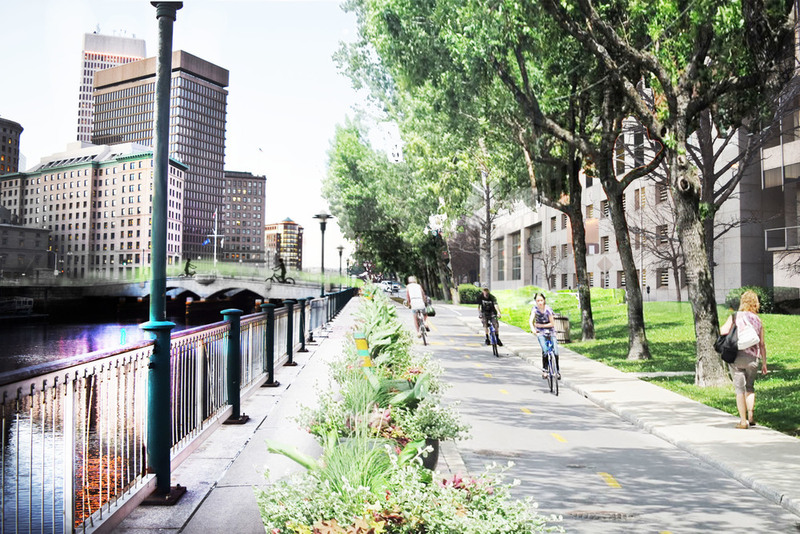 The following proposes the transformation of a one way street along the river into a greenway that combines a much-needed bike accessibility with public outdoor space and opportunities for renewable energy collection (primarily solar and hydropower). The relationship of the existing architecture to the water and the structure of the city as a whole influenced the strategic placement of the greenway along South Water Street -- connecting the downtown of Providence with the East Bay Bike Path. Bikeshare concept for Providence, RI. South Water Street as a community greenway. South water street could become a community greenway if its one way traffic is transferred to South Main street, making a safer and more convenient two-way street. Initial sketches (above) depict more environmentally sustainable, community-oriented uses of outdoor public space in Providence.